Anagarika Dharmapala (1864 — 1933) was born David Hewavitarne in Colombo, Sri Lanka. Sri Lanka was then a British colony known as Ceylon, so Hewavitarne’s state education was a Christian one: he attended Christian College, Kotte and the Colombo Academy. But the historical tide in Ceylon was beginning to turn in Buddhism’s favour. In 1875 in New York, Madame Blavatsky and Colonel Olcott had founded the Theosophical Society. They were both very sympathetic to what they understood of Buddhism, and in 1880 they arrived in Ceylon, declared themselves to be Buddhists, and publicly took the Refuges and Precepts from a prominent Sinhalese bhikkhu. Colonel Olcott remained in Ceylon and devoted himself to the cause of Buddhist education, eventually setting up more than 300 Buddhist schools, some of which are still in existence. The young Dharmapala helped Colonel Olcott in his work, particularly by acting as his translator. Dharmapala also became quite close to Madame Blavatsky, who advised him to study Pāli and to work for the good of humanity — which is what he did. It was at this time that he changed his name to Dharmapala (meaning «Guardian of the Dharma«). In 1891, he paid his first visit to the holy places of northern India and found them in a very neglected condition. Some of them were no more than ruins. The Mahabodhi Temple at Bodh Gaya had been restored by General Sir Alexander Cunningham, but there was no one maintaining it, and when Dharmapala arrived he decided to look after it until Buddhist monks could take over. However, the temple belonged to a Hindu abbott, and there ensued a long legal battle which Dharmapala finally lost in 1906. Meanwhile, Dharmapala founded the Maha Bodhi Society to help him in his work. Initially, this comprised the task of restoring Bodh Gaya to something of its former splendour, but the scope of the society’s activities soon expanded to involve the promotion of Buddhism in India and eventually the development of Buddhism throughout the world. A natural extension of this work was to set up, in 1892, the Maha Bodhi Journal. In 1893 Dharmapala was invited to attend the World Parliament of Religions in Chicago as a representative of «Southern Buddhism» — which was the term applied at that time to the Theravada. He was a great success and by his early thirties he was already a global figure, continuing to travel and give lectures and establish viharas around the world during the next forty years. At the same time he concentrated on establishing schools and hospitals in Ceylon and building temples and viharas in India. Among the most important of the temples he built was one at Sarnath, where the Buddha first taught. Here in 1933 he was ordained a bhikkhu, and he died at Sarnath in December of the same year, aged sixty-nine. Dharmapala was a leading figure in initiating two outstanding features of Buddhism in the twentieth century. 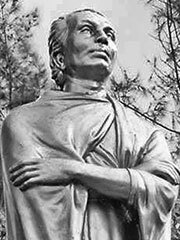 He was a pioneer in the revival of Buddhism in India after it had been virtually extinct there for several centuries, and he was the first Buddhist in modern times to preach the Dharma in three continents: Asia, North America, and Europe. Dharmapala was the first anagarika — that is, a celibate, full-time worker for Buddhism — in modern times. It seems that he took a vow of celibacy at the age of eight and remained faithful to it all his life. Although he wore a yellow robe, it wasn’t of the traditional bhikkhu pattern, and he didn’t shave his head. He felt that the observance of all the vinaya rules would have got in the way of his work, especially as he flew around the world. Dharmapala’s voluminous diaries have been published, and he also wrote some memoirs. The above was adapted from Sangharakshita, Great Buddhists of the Twentieth Century, Windhorse Publications 1996, with permission.